The Hangout was chosen by CBS Los Angeles for the "Top 5 Best Bloody Mary in Orange County, CA." Our Signature Cocktail has also been featured in The Drunken Tomato, a guide by expert and author Shelley Buchanan. Wondering where to get a Bloody Mary near you? Our relaxing restaurant bars offer 5 variations with incomparable service. In the pantheon of great cocktails, most concoctions fall into sweet or sour. The Bloody Mary is unique, mysterious and complex; a number of tastes rolled into one. It's the quintessential drink before brunch or dinner. Not all are made equal. According to many authoritative sources, it's said to be the world's most complex Cocktail. Getting the ingredients right takes a deft hand and a good eye. One sip and we'll be your go-to-place. So how do we have the Best Bloody Mary in Orange County? Our unique recipe separates us from the pack. Ingredients include choice Vodka, Tomato Juice, Fresh Cut Celery, Crispy Bacon and mouthwatering Shrimp! On Sundays, our Bloody Mary Special is not to be missed! Drinks start at just $5.00 all day! Don't take our word, taste it yourself. Visit one of our two Restaurant Bars! Our Cocktail Menu below offers 5 amazing choices. Find yours. Our Classic Bloody Mary is made in a Tall Glass with a Salted Rim. We have the best well in Seal Beach and use Seagram's Vodka for these Classic Cocktails. We garnish with Olives, Fresh Celery, and Limes for a perfect Cocktail noon or night. Made in a Tall Glass with a Salted Rim, we use Tito's® Vodka infused with Jalapeño. We season with Tabasco Sauce. It's then garnished with Olives, Pepperoncini, Fresh Cut Celery, and Limes for a perfect combo. Rock n' roll. Delivered in a Tall Glass with a Salted Rim with Absolute Peppar® Vodka. It's then mixed with Clamato Juice and Olive Juice. We garnish with Olives, Fresh Cut Celery and Limes for a perfect Cocktail combination. Of course, we got as excited about the Bacon craze as everyone else when we found Bakon Vodka™ (yes its spelled like that). This cocktail is made in a 16 ounce Pint Glass with a Bacon Salted Rim. Bakon Vodka and garnish with a Crisp Strip of Bacon, Olives, Fresh Cut Celery and Limes. It stands out. One thing led to another and we got carried away. Made in a 16 ounce Pint Glass with a Salted Rim, we use GREY GOOSE® Vodka. We garnish with a Crisp Strip of Bacon, 2 Jumbo Shrimp, Olives, Fresh Cut Celery, Lemon and Limes. If you want the Best Bloody Marys near you, visit us at one of our Restaurant Bars. We mix these Cocktails up like few can! Our Sunday Brunch features our Bloody Mary Happy Hour special all day. Visit one of our convenient Restaurant Bars for world- class Bloody Marys nearby. Our locations are commutable from Long Beach, Sunset Beach, Fountain Valley, and Bella Terra. From Newport Beach, we're 29 mins and worth the drive! Our wide Cocktail selection won't disappoint! Experience world-class value and service. Drink the Best Bloody Marys steps to the iconic Seal Beach Pier with great views. Talk with our award-winning bartender! 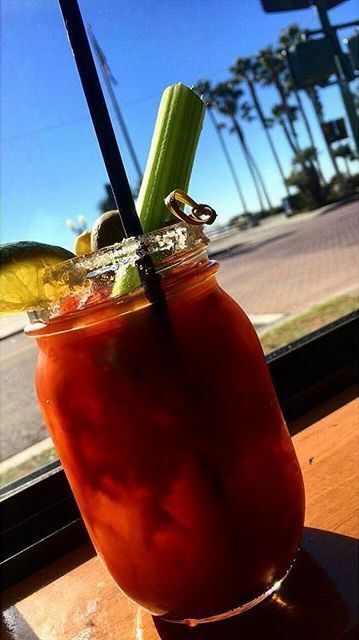 For the best Bloody Marys in Huntington Beach, we're near Bella Terra and the Harbor Mall. Our outdoor patio is cozy with TVs throughout that carry the latest sports. The origin of the Bloody Mary Cocktail continues to be a matter of dispute. Invention was claimed by Fernand Petiot, a Bartender. In 1934, Petiot maintains he enhanced and perfected the Cocktail with other ingredients at the St. Regis, New York. Comedian George Jessel believes he created the Cocktail while visiting Palm Beach in 1927. Others insist imbibers F. Scott Fitzgerald and Ernest Hemingway created it during a long night. One thing is certain. It's mystique endures and it's a drink that remains timeless. Although associated with a garnish, it was not until sometime between 1950 to 1960s, that the Celery Stick was added. The name is most commonly associated with Queen Mary I of England due to her persecution of protestants circa the 17th century.